You might have face several issues while installing SQL Server on the standalone server and on cluster, some of the errors are mentioned below; I hope this could help you in resolving some issues. When you encounter this error first of all check for logs in location C:\Program Files\Microsoft SQL Server\90\Setup Bootstrap\LOG\Files and check for SQLSetupNumber_ServerName_Core(local).log and check for below mentioned error. Error: Action “InstallToolsAction.10” threw an exception during execution. Error information reported during run:Target collection includes the local machine. To work around this problem, set the folders in the correct layout for the SQL Server 2005 installation. In this example, the D:\SQLServer2005 folder is the location to which you want to copy the files from the SQL Server 2005 installation CDs. Copy all the files from the SQL Server 2005 installation CD that is named Servers to the D:\SQLServer2005\Servers folder. Copy all the files from the SQL Server 2005 installation CD that is named Tools to the D:\SQLServer2005\Tools folder. Open the D:\SQLServer2005\Servers folder, and then double-click Setup.exe to start the SQL Server 2005 Setup program. You could face a this issue when the primary domain has many external trust relationships with other domains, or when many lookups are performed at the same time, the time that is required to look up domain group names may increase significantly. Therefore, the time that is required to install SQL Server 2005 may also increase. To resolve this issue MS has suggested a hotfix below is the link to resolve this issue. Windows Error Text: The service did not respond to the start or control request in a timely fashion. This situation can be True in case of below mentioned conditions. 1. The ratio between logical processors and physical sockets is not a power of 2. For example, the computer has a single socket together with a triple-core processor. 2. The number of physical cores is not a power of 2. 3. The total number of CPUs is an odd number. For example, there are seven or nine CPUs. There were 2 workaround to resolve this issue one is to change the NUMPROC value to 1 in boot.ini advanced configuration, and the other method is to extract the SP and run the setup using command line along with this Hotfix, for more details follow the below mentioned link suggested by MS. This issue occurs when you install SQL Server 2005 on Windows Server 2008 and the full text service fails to start, this problem occurs because the NTLM Security Support Provider (NTLMSSP) service does not exist on Windows Server 2008. However, the full-text search service depends on the NTLMSSP service. However the workaround is very simple to resolve this issue you have to install SQL Server 2005 SP2. This issue occurs when you install SQL Server 2005 on Windows Server 2008 failover cluster and you receive this error message “All resources did not come online and therefore you will need to manually set the cluster restart option”. This error occurred because full text service fails to start, this problem occurs because the NTLM Security Support Provider (NTLMSSP) service does not exist on Windows Server 2008. However, the full-text search service depends on the NTLMSSP service. However the workaround is very simple to resolve this issue you have to install SQL Server 2005 SP2. >> The setup has encountered an unexpected error while Completing Commit. The error is: The cluster resource cannot be made dependent on the specified resource because it is already dependent. This error occurred because there is a known compatibility issue with SQL 2005 Setup and Windows Server 2008 Failover cluster. Setup tries to add the network name or the shared disk as a dependency to the SQL Server resource, and this fails because the dependency already exists. There is no workaround available for this issue. At the time of the most recent update to this article, SQL Server 2005 is in extended support phase, and this issue will not be fixed in this release. If you have to perform any of the actions mentioned above, you will have to uninstall the existing instance of SQL Server and reinstall it with the new edition/collation changes. e. On the File menu, click Export. h. In the right-pane of the Registry Editor window, right-click PendingFileRenameOperations. On the shortcut menu that appears, click Delete. i. In the Confirm Value Delete message dialog box that appears, click Yes. j. On the File menu, click Exit. l. Using the Registry Editor, verify that the PendingFileRenameOperations registry value is not available. 2. Check other control set keys (for example, ControlSet001, ControlSet002, and so forth) for the same values and also delete them. Please make sure that if the setup failed and there is a SQL instance installed earlier then you must delete the below mentioned registry key for starting the installation again. Rule “SQL Server Database Services feature state” failed. Resolution: Please follow the below mentioned steps to resolve this issue. Being a DBA if someone asks you a question which SQL Server Edition should I go for, well it’s a very tricky questions both for DBA and for the customer as he doesn’t want to shed an extra penny from his pocket. Well MSDE is the Microsoft Data Engine and is a scaled down version of Microsoft SQL Server 2000 intended primarily for development use or as a backend database for small office systems. While intended to have a lighter load on system resources than an actual installation of Microsoft SQL Server 2000, it is an otherwise functionally identical SQL database engine to its larger sibling. It is limited to a 2GB database, only supports servers up to 2GB RAM and two processors, and doesn’t support advanced SQL Server features such as BI, RS, Full Text Indexing/Search. The biggest disadvantage of MSDE is the fact that it does not include a GUI management tool and incorporates a performance governor. However if you have purchased a license for SQL Server 2000, then you can use the Enterprise Manager tools included with that to manage your MSDE. The most significant issue with using MSDE is potentially the performance governor. This artificially limits the performance of the database engine by throttling the number of queries it can process at simultaneously as a result of which it is not suggested not to use MSDE with live production website. Hence the product is unsuitable for all but the most trivial of real-world needs or personal use. If we talk about SQL Server 2005, then we have SQL Server Express Edition available free of cost. Moreover the SQL Server 2005 Express Service Pack 1 (SP1) now offers a useful set of GUI administration tools. Running SQL Server 2005 Express on a fast dual-core server with 1GB of memory will give you a remarkably capable platform for lower-end production uses. SQL Server 2005 Express with Advanced Services even includes support for Reporting Services. There is also SQL server workgroup edition and It is mostly used as a data management solution for small organizations that need a database with no limits on size or number of users. Workgroup Edition can serve as a front-end Web server or for departmental or branch office operations. It includes the core database features of the SQL Server product line and is easy to upgrade to Standard or Enterprise Edition. SQL server 2005 workgroup has Management Studio, Import/Export, Limited Replication Publishing and Backup Log Shipping; and for all this you have to shed around 4000$\Processor or around 730$\5 users. If you want to use SQL Server for developers then the other option for database developers is SQL Server 2008 Developer Edition. Unlike Express Edition, Developer Edition has no limitations on database size, performance characteristics or functionality. However, it’s only licensed for use by a single developer in a non-production development environment. Now we talk about the 2 primary editions for SQL Server: Standard and Enterprise. Standard edition provides basic SQL Server features and will serve the needs of most businesses. Enterprise edition offers additional functionality and a much heftier price tag. If you are working on Large volumes of data and Working with terabyte-class databases or billion-row tables and need functionality likes offers table partitioning, parallel indexing, and indexed views that can significantly improve performance in large environments then you must choose Enterprise Edition. Moreover if You are working in a high-availability, mission-critical environment in which you want system to be running a 24/7/365 then features like Online indexing will allow you to maintain indexes without scheduling down-time, and Online Restore and Fast Recovery are both options you want when recovering from a failure. Enterprise Edition is the only Edition that allows you to replicate data from Oracle. Enterprise Edition also provide some more advanced BI features, such as parallel processing, cube partitioning, and text mining, hence if you are working with large BI solutions then Enterprise Edition is suitable for you. So if you have a limited budget then SQL Server Standard is significantly less expensive than Enterprise when purchased on licensed per CPU. The conclusion, If you do not fall into any of these categories, then Standard edition will most likely suffice. Some of the Myths come in mind while choosing and edition. Standard isn’t as stable as Enterprise. Not true. Standard and Enterprise both use the same core; the only difference is the additional features that Enterprise provides. My other database servers are Enterprise, so all of my new servers need to be Enterprise, too. Not true. While having a homogeneous environment does simplify many things (planning, maintenance, etc. ), you can easily mix and match SQL Server editions within an environment to best meet your needs (and budget!). I need Enterprise edition in order to replicate partitioned tables. Not true. Replication can exist between partitioned and non-partitioned tables. In fact, replication by default does not create partitioning schemas on the subscription database, so the destination table is not partitioned unless explicitly requested. That said, if the source tables are partitioned, there may be good cause for the destination tables to be partitioned too, and Enterprise edition should be seriously considered. I need Enterprise edition in order to cluster. Not true starting in SQL Server 2005. Both 2005 and 2008 Standard editions support 2 node clusters. In a lot of enterprises, you will see Enterprise installed for clustering only. If you have a two node active/passive cluster and that is your only reason: you are probably overpaying and could be fine with standard edition. Not true with 2005 or 2008. These versions of SQL will address as much memory as the OS allows in Standard or Enterprise edition. Why do we need Service Pack, Cumulative Update and Hot Fixes? A service pack (SP) is a collection of updates, fixes and/or enhancements to a software program delivered in the form of a single installable package. Many companies, such as Microsoft typically release a service pack when the number of individual patches to a given program reaches a certain (arbitrary) limit. Installing a service pack is easier and less error-prone than installing a high number of patches individually, even more so when updating multiple computers over a network. When a new version of a product is being developed, it may be made available to selected customers and community members for early testing and is sometimes called alpha builds of the product. As development progresses and the product become more and more polished, it’s provided to a wider audience. This used to be called beta releases; for example beta 1, beta 2, etc. However a few years ago Microsoft changed the terminology for SQL Server pre-releases. They are now referred to as CTPs (Community Technology Previews). You can download the November CTP, for example. As the product enters into it’s final stages before release, the feature set is complete and the product is undergoing final testing, it’s called an RC (Release Candidate). After a product has undergone significant testing and it’s determined that no more changes will be made to the product before release, it’s sometimes said that the product has gone golden. It’s also called a GA (General Availability) release and once the bits been turned over to a company to mass produce the media (CDs, DVDs, etc), it’s called RTM’d (Released To Manufacturing). Usually sometime around the RTM, the product version is “launched”. The timing of the launch may or may not have any correlation with the time the product is actually available for purchase. The launch has more to do with marketing and product feature education than availability. Finally the product is released! It’s available for purchase. Here comes the part you are looking for…. Over the period of time, Hot Fixes are created by the dev team to address specific product issues affecting certain customers. Sometimes the issue is so wide spread, a GDR (General Distribution Release) is issued so that all customers will receive the updates. Since hot fixes and GDRs are designed to quickly address specific problems encountered by specific customers, they can be issued rather often. The rapidity of the hot fixes and GDR’s makes it impractical for many IT shops to keep up with the pace of the releases. So, a CU (Cumulative Update) is created that contains all of the applicable hot fixes. This makes it easier for customers who haven’t been directly affected by the issues that sparked the hot fixes to remain current. Once a large enough collection of changes have been gathered, an SP (Service Pack) will be issued. Historically, SPs have also been the release vehicle used to deliver new features that were not ready at the time of GA. For example, Database Mirroring was made available in SP1. SP2 brought us the custom reports as in the Performance Dashboard. Microsoft has since administrators better understand the difference between a CU, IU, and SP. Microsoft SQL Server is a relational model database server produced by Microsoft and lets talk about how SQL Server comes to the Avtar we now it today. Prior to SQL Server version 7.0 the code base for MS SQL Server was sold by Sybase SQL Server to Microsoft corporation, and tha was begining point of Microsoft’s into enterprise-level database market, competing against Oracle, IBM, and, later, Sybase. The first version named SQL Server 1.0 for OS/2 (about 1989) which was essentially the same as Sybase SQL Server 3.0 on Unix, VMS, etc. Microsoft SQL Server 4.2 was shipped around 1992 (available bundled with IBM OS/2 version 1.3). Later Microsoft SQL Server 4.21 for Windows NT was released at the same time as Windows NT 3.1. Microsoft SQL Server v6.0 was the first version designed for Windows NT. In the year 2008, another sensational evolution was happened for SQL Server, the birth of SQL Server 2008, with exceptionally good new features. SQL Server 2008 is an advanced version as compared to SQL Server 2005, which has the support for handling Spatial and Geographic data, which was major turning point for SQL Server. Until SQL Server 2008, it was difficult to maintain geographic information in SQL Server databases, the introduction of new geographic and spatial data types has the rocked the world of Application Development and Data handling. The features like Change Data Capture (CDC), Data compression, Resource Governor, Backup compression, Partition-aligned indexed views, Central Management Servers, Policy-Based Management, Transparent and Data Encryption made SQL Server 2008 a good competitor against other enterprise-level database engine available in the Market. SQL Server has now released a more advanced version SQL Server 2012 which contains features like AlwaysOn, ColumnStore Indexes, User-Defined Server Roles, and Enhanced Auditing Features etc. Till then SQL Server has released various SQL Server Versions and capturing enterprise level database market at a very fast rate, and rich GUI various new features coming in the different versions work as a catalyst. SQL Server has around 18% to 20% market share as per information on Web and is growing at a very rapid rate. What is SQL Server ? SQL Server is Microsoft’s relational Database Management System (RDBMS) like other RDBMS Oracle, SYBASE, MySQL and DB2. Microsoft has released to compete against competitors like Oracle Database (DB) and MySQL. SQL Server supports ANSI SQL Like all major RBDMS, the standard SQL language. However, SQL Server also contains T-SQL, its own SQL implementation. SQL Server Management Studio (SSMS) (previously known as Enterprise Manager- SQL2000 and previous versions) is SQL Server’s main interface tool, and it supports 32-bit and 64-bit environments. SQL Server was released in various editions like Enterprise: Designed for large enterprises with complex data requirements, data warehousing and Web-enabled databases. Has all the features of SQL Server and its license pricing is the most expensive. Standard: Targeted toward small and medium organizations. Also supports e-commerce and data warehousing. Workgroup: For small organizations. No size or user limits and may be used as the backend database for small Web servers or branch offices. Express: Free for distribution. Has the fewest number of features and limits database size and users. SQL Server also includes more add-on services however these are not important for the operation of the database system, they provide value added services on top of the core Database Management System. These services either run as a part of some SQL Server component or out-of-process as Windows Service and presents their own API to control and interact with them. SQL Server Replication Services are used by SQL Server to replicate and synchronize database objects, either in entirety or a subset of the objects present, across replication agents, which might be other database servers across the network, or database caches on the client side. Replication follows a publisher/subscriber model, i.e., the changes are sent out by one database server (“publisher”) and are received by others (“subscribers”). The SQL Server Analysis Services, or SSAS, is a multidimensional analysis tool that features Online Analytical Processing, powerful data mining capabilities, and deeper dimensions to business information within a relational database. Multidimensional analysis is an OLAP technique that produces the ability to analyze large quantities of data by storing data in axes and cells instead of the traditional relational two-dimensional view in rows and columns. SSAS places predictive analytic capabilities in the hands of information workers by creating an instant connection to backend data using familiar applications such as Microsoft Excel and SharePoint for analysis, visual presentation and collaboration. Microsoft has come up with its own reporting service; along with SQL server database to introduce the Microsoft SQL Server Reporting services also known as SSRS. SSRS solution is a web based solution in which the report can be shared among different customers, stake holders and top management on a web based platform. SSRS is a comprehensive reporting platform whereby reports are stored on a centralized web server and because of that the deployment is quite simple. 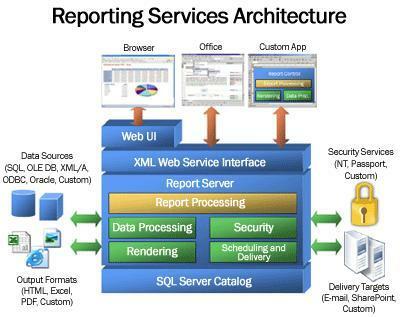 This innovative approach that Microsoft introduces in SSRS enables users to create report with lesser efforts. SQL Server Integration Services is most advanced tool and is used to integrate data from different data sources like Oracle, SQL, or Sybase. It is used for the Extraction Transform and Load capabilities for SQL Server for data warehousing needs. 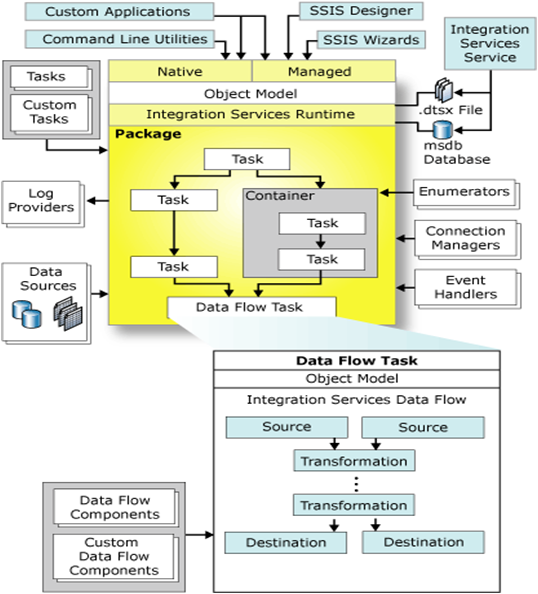 It includes tools Business Intelligence Studio to build data extraction workflows integration various functionality such as extracting data from various sources, querying data, transforming data including aggregating, duplication and merging data, and then loading the transformed data onto other sources, mail notifications. Used inside an instance, it is used to provide an asynchronous programming environment. For cross instance applications, Service Broker communicates over TCP/IP and allows the different components to be synchronized together, via exchange of messages. The Service Broker, which runs as a part of the database engine, provides a reliable messaging and message queuing platform for SQL Server applications. SQL Server Full Text Search service is a specialized indexing and querying service for unstructured text stored in SQL Server databases. The full text search index can be created on any column with character based text data. It allows for words to be searched for in the text columns. While it can be performed with the SQL LIKE operator, using SQL Server Full Text Search service can be more efficient. Notification Services is a framework for making rich but scalable event and subscription-matching applications. Developers use Notification Services to build alerting applications that generate and deliver alerts for events (e.g., an alert that tells a customer that an out-of-stock item is available for order). Typically, events generate notifications that match criteria from user-generated subscriptions. MSN Alerts uses Notification Services to generate several million notifications per day. 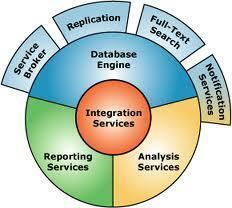 Notification Services is part of the Microsoft SQL Server Business Intelligence (BI) platform. When you look at Microsoft’s three BI pillars–Integrate, Analyze, Report–you see that Notification Services is an important feature for the Reporting pillar.